Happy Hump day!! Can't believe we are half through the week already!! Funny story... Justin Krieger and I do a lot of card designing on FaceTime... So today while on FaceTime I had this not so brilliant idea to use glitter with heat and stick... Well it wasn't a good idea after all and well, the glitter spilled all over my legs that were in shorts... Yay for me!!! 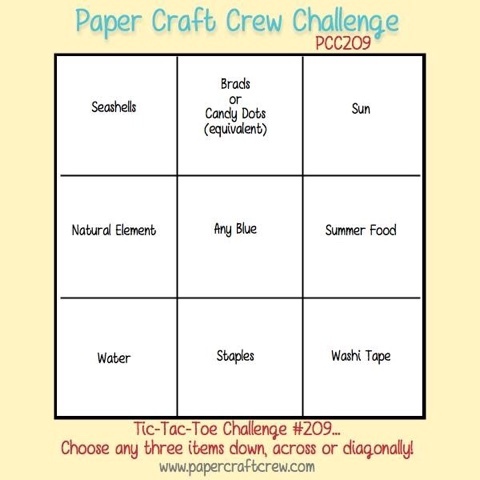 This week with The Paper Craft Crew we have a really fun Tic Tac Toe and I went straight down the center from top to bottom with Dots, Any Blue and Staples! I wasn't quite sure how I was going to pull this weeks challenge off... I mean, the ocean shaker a few weeks ago would have been a great card for this challenge... I gathered the papers that I thought were blue and narrowed it down one by one! 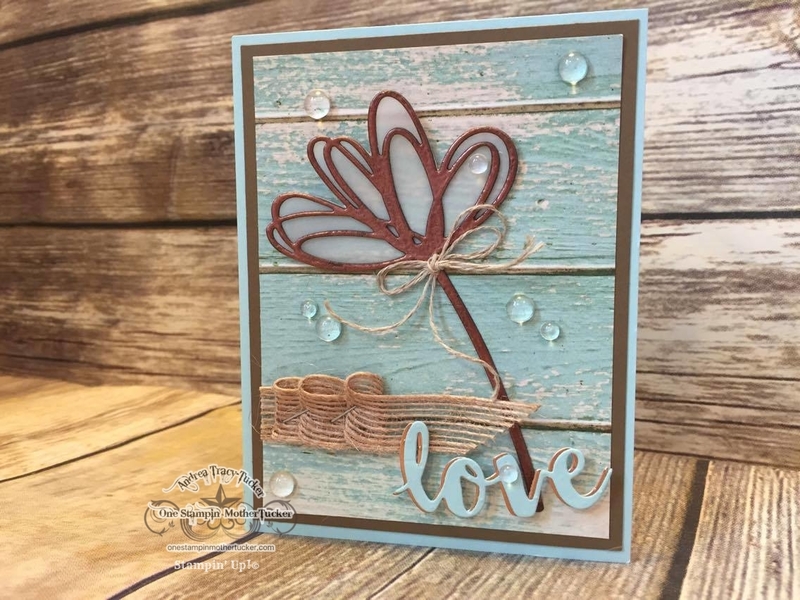 We all know that the Serene Scenery stack is amazing and can make a simple card really fabulous! I matted the wood pattern from the stack onto Soft Suede card stock then adhered it to the Pool Party Base. It coordinated with the grooves of the wood. My lovely copper flower was made by die cutting the shape out twice, adhering the die cuts with spray adhesive and then inking up the top layer with Versamark to heat emboss it with the Copper embossing powder! I kind of did the same thing with the "Love" sentiment from Sunshine Wishes... Although I let some of the Copper Foil peak out the edges. The ribbon was stapled into pleats, tied a cute linen thread bow and added some great dew drops and this card was done! No cats game for this girl!!! Thank You so much for stopping by! I can't wait to see how you make your 3 in a row! Gorgeous! Love the stapled ribbon pleats!! I have never used Dew Drops. I am guessing it doesn't come out of a bottle but is kind of like our pearl and rhinestone embellishments with Stampin'Up? I love your card by the way. One more question, what kind of spray adhesive do you use, and do you use it with the silicone mat?